It sounds great! I want to know more – I can’t say I like the picture of Gerald from the blurb or the opening paragraph. I agree Margaret… but perhaps we don’t need to like him? I’ve read it and it’s brilliant! I’ve already read it so I might be a bit biased but I would definitely keep reading, it’s very good. Oh it’s such an interesting one! I liked it a lot! I’m hooked already, adding it to my list. This does sound very intriguing, Cleo! And I like the plot point of the psychologist trying to work out why and how the murder happened, when the patient won’t say a word! I’ll be really interested in what you think of this one. It certainly has a fascinating premise doesn’t it? I will be interested too! I’ve seen this one on a couple of other blogs with the US cover. It sounds quite intriguing, though Gerald’s photography style doesn’t appeal to me at all. I’ll be curious to hear what you think about it. I really want to read this one! Wouldn’t be surprised if it gets made into a movie. It would be a good one! It does sound good… thanks for the visit! I’ve added it to my TBR list. It sounds good. Oh yes. The combination of the blurb and the first paragraph has got me absolutely hooked. Off now to add another title to my TBR. You are a very bad influence! Not my usual read but I hope you like it! Here’s my Tuesday post! Hope you’re having fun! 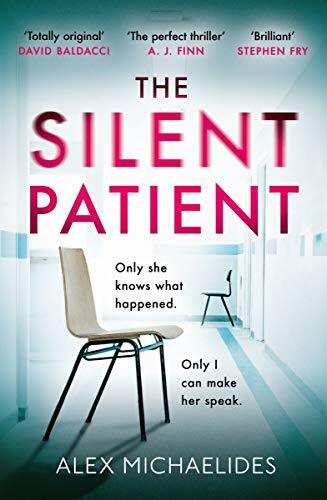 The Silent Patient was released in the U.S. today, and I’m looking forward to reading it. I’ve not heard about this book but it does sound interesting. I love a good thriller!